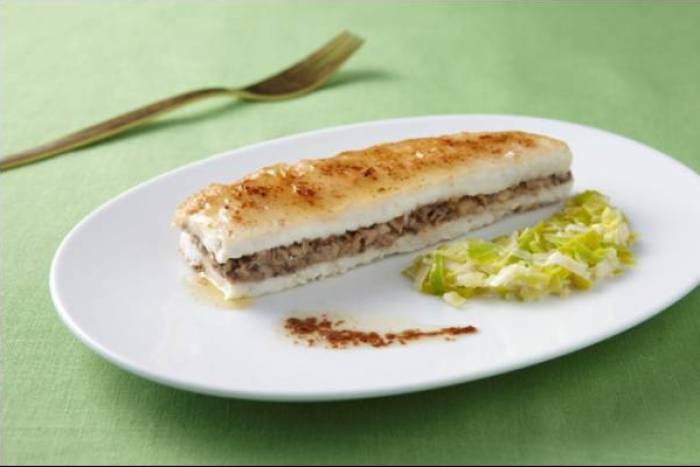 Sections of sole cooked meunière style, filleted, then stuffed with a mushroom purée, served with cooked leeks and a lemony sauce. Trim the leeks and only only keep the white and tender green part of the leaves. Split them in four lengthwise without going all the way down, then wash and drain them. Finely slice them. In a casserole pan with a knob of butter, sweat the leeks with a pinch of salt. Add 100ml of cream and cook over a low heat. Peel the mushrooms and the shallot. Dice the shallots and quarter the mushrooms. Pour a lug of olive oil into a pan then sweat the shallots with a pinch of salt. Add the mushrooms, then the rest of the cream. Bring to a boil, then whiz and check the seasonning. Put the mushroom duxelle back into the pan, cook it again to dry it out. Put it aside. Preheat the oven to 200°C. Trim the soles, then cut them in 2 lengthwise and flour them. In a very hot frying pan with olive oil, cook the soles, skin side down. Add the butter, the garlic clove and cook a few minutes over a low heat. Turn over the soles and keep cooking them, drizzling them with the butter from the pan. remove from the heat and let rest for a moment. Fillet the soles, then stuff the soles with the mushroom duxelle. Check the seasonning. Put the fish into the oven for 5 minutes. For the sauce, add a splash of lemon juice to the butter from the pan. Arrange a bed of leeks on a plate, place the soles beside it, make a line of mushroom duxelle and accompagny everything with the sauce.